Peach season is here and what better way to enjoy luscious peaches than in a wonderful streusel topped peaches and cream pie. One of my favorite desserts is pie, so I was delighted when I recieved a copy of A Year Of Pies by Ashley English to review. Ashley blogs at Small Measure about her life, family and cooking in a small North Carolina mountain town. 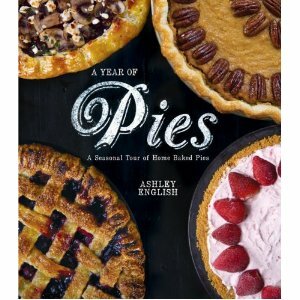 Ashley is the author of several books, and A Year of Pies is her latest. 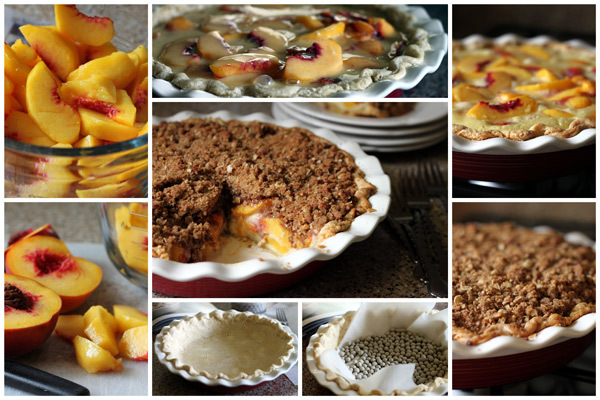 In a Year of Pies Ashley shares 60 delicious pie recipes arranged according to the seasons. I’d love an Apple Creme Brulee Mini Pie this fall, an Orange Curd Tart with Almond Crust in the Winter, and an Apricot Almond Galette next Spring. But since it’s late summer and the peaches are ripe and juicy, it’s the perfect time of year for her luscious Peaches and Cream Crumble Top Pie. My family enjoyed this pie. My husband especially loved the crumble topping with the pecans. I made Ashley’s all butter crust recipe and it wasn’t as flaky as my favorite crust recipe, but I’ve never had much luck with an all butter pie crust. I did make a couple of changes to the original recipe. I added oatmeal to the crumble for a little additional texture and subbed vanilla instead of almond extract because I’m not a fan of almond extract. In addition to the great pie recipes, I love the first section of the cookbook, Pie-Making Basics. 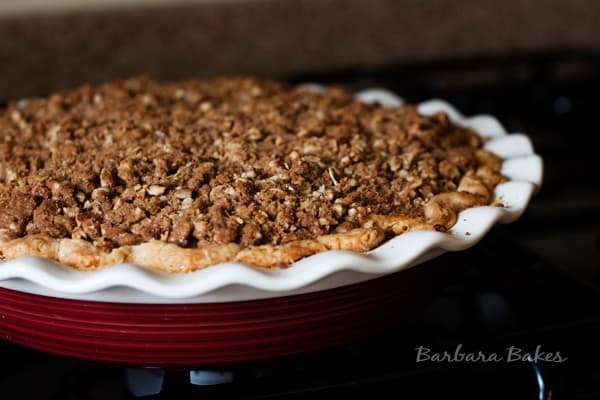 Ashley talks about the tools and ingredients you’ll need to make a great pie. There’s also wonderful step-by-step how to instructions and photos of making pie crusts. A Year of Pies is a great resource, especially if you’re new to pie making. Ashley discusses pie pans and recommends buying a pretty ceramic pie pan because they conduct heat well and are beautiful for serving. I was given the pretty pie plate in the pictures by Corningware. Next week I’m doing another pie post and hosting a giveaway for a Corningware etch™ Brick 9.5″ Pie Plate and a etch™ Brick 7-pc Bakeware Set, so be sure and stop in next week. Roll out the dough on a lightly floured surface and fit into a 9 inch deep-dish pie plate. Trim the crust overhang to 1 inch and crimp the edges decoratively. Prick the bottom of the crust with a fork, then place the crust in the refrigerator for 15 minutes. Line the crust with parchment paper and fill it with dried bean or pie weights. Bake 10 minutes, then remove it from the oven. Remove the dried beans or pie weights and parchment paper from the crust, and cool it completely before filling. Combine all the topping ingredients in a medium-size bowl. Using your hands or a pastry cutter, mix everything together until the butter is well incorporated and the mixture forms pea-size crumbles. Cover the bowl with a kitchen cloth and place in the refrigerator to chill until ready to use. Whisk together the eggs, egg yolks, sour cream, flour, sugar and vanilla extract in another medium-size bowl. Arrange the peach slices over the bottom of the cooled crust. Pour the filling over the peach slices. 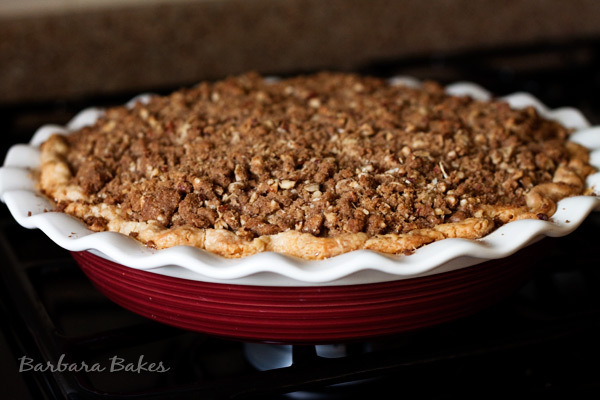 Set the pie pan on a rimmed baking sheet and bake in a 375º oven for 35 minutes. Remove the pie from the oven, leaving the oven on. Sprinkle the chilled crumble topping evenly over the custard filling, then return the pie to the oven to bake an additional 15 minutes, until the crumble is golden brown. Cool at least one hour before serving. So glad the pie was a hit. Sorry the topping didn’t brown. Mine almost got too brown. Next time you could try putting the pie under the broiler to brown the top. Cover the pie crust with foil if it’s already browned. Just watch it closely so it doesn’t get too brown. Thanks for the feedback! My goodness, your pie looks absolutely delicous. Slurppp,….